The sweater is done. Finally. The Noro yarn was splendid to knit with in this project. I love the colors in this yarn. They are just fantastic. This would be wonderful yarn to use again. I'm certainly keeping it on my enjoyable yarns list. Now for the not so good part. The sweater itself was not an easy knit nor did it come out very well. The sizing is certainly off and makes for an awkward fit. I hope that by fall it will be more appropriate in size. 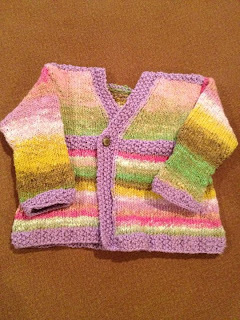 While this sweater did not turn out as great as I hoped it would the colors really are so cheerful. So I will pack away my disappointment and this sweater for later. Maybe looking at this sweater 7 months from now will provide me with a whole new perspective about its possibilites for wear. Since I am done with this kimono sweater I can turn my focus on another project. I didn't expect this sweater to be such a bust. It put my plans behind for making my three girls Mama made sweaters. Instead of worrying about this let down I have decided to try something new. I'm going forward with the Tiny Tea Leaves cardigan for Adelynn. If this new project turns out well then I'll proceed with making one for the other two girls. It would be nice to have my three girls wearing the same style sweater.